Looking to catch the next hot thing in the wireless world. Earlier today I wrote about UP. And here’s another product that wants you to get fit. They just won’t give this a rest, will they. 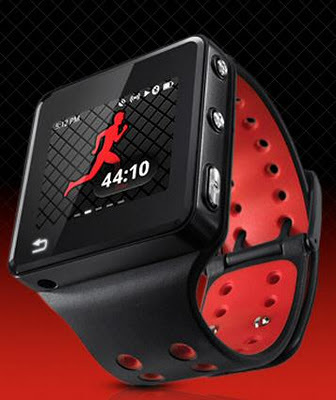 This evening Motorola announced the “MOTOACTV,” a device that’s a cross between a Garmin GPS sports watch and an Apple iPod nano. Plus it acts as an external display for reading messages received on an Android device (likely Motorola devices only). Like the UP device, MOTOACTV tracks activities such as running, biking compiling data on distance covered, speed, and calories burned. But as this is also a music player, Motorola says that MOTOACTV can learn which music motivates the user the most. MOTOACTV will come in an 8GB version for $250, and a 16GB version for $300. These can be paired with Motorola's new Bluetooth headphones with built-in heartrate sensors which pick up blood flow in the ear. The headphones are not included and cost between $100 and $150 depending on the model. Motorola said that the MOTOACTV is “built on the fundamentals of Android,” the meaning of which isn’t so clear. It has a 600MHz processor, FM Radio, scratch-proof capacitive touchscreen, outdoor readable display, is sweat-and rain-proof. Workouts can be uploaded to Twitter and Facebook. It was a bit of a surprise to see Motorola get into this business. While many are comparing the MOTOACTV to the iPod nano, this is really Motorola getting into Garmin-Polar-Nike+ territory here. This is a niche but growing market: this won't drive MOTO profitability, but it’s nice technology display. We’ll certainly see a growing trend of passive collection of health-related info. Let’s watch this space.